Experience the irresistible allure of Vietnam on this journey from north to south. Delve into the surprises of sophisticated French-colonial cities and quaint heritage towns, tasting true Vietnam at every turn. Venture through emerald waters to the hidden bays and remote islands of Lan Ha Bay. And encounter the people, culture and cuisine that together make this country so vibrant. Arrive in the elegant Vietnamese capital and transfer to your iconic hotel. Spend your morning discovering the many sides to this enthralling city. Begin your tour at the mausoleum of Vietnam’s revered revolutionary leader, Ho Chi Minh. Linger over the iconic One Pillar Pagoda and stroll through the complex of atmospheric halls, pavilions and courtyards of the Temple of Literature, Vietnam's first university. After lunch, meet celebrated Vietnamese performance artist and painter Doan Minh Hoan. Join her in the National Museum of Fine Arts where she’ll share a fascinating insight into Vietnamese art. Day 3: Design Your Day Hanoi. Today, choose how to continue your Hanoi discovery. Join your private guide for a locals-only half-day tour through Hanoi’s food culture. Your degustation begins in the labyrinthine streets and alleyways of the Old Quarter, where street vendors reveal all the flavours of Vietnamese cuisine. Continue to Dong Xuan to discover first-hand how it earned the nickname “Food Street”. Try the locally brewed foamy beer bia hoi and drink like a true Hanoian – perched on a stool on the street corner. Then, take a ride to Truc Bach Lake where a medley of meat-stuffed dumplings, sweet and savoury cakes, and spring rolls await. For dessert, surprise your tastebuds with cà phê trúng (egg coffee), a deliciously sweet Hanoi favourite invented here during a milk shortage in the 1940s. Alternatively, venture into ancient villages for a full-day discovery of rural Vietnam. Begin at the elegant Moon Garden House in Ky Son village. Learn the secrets of traditional Vietnamese cuisine in a cooking class, before devouring the fruits of your labour. Later, hop in the saddle for a guided cycling tour through the village. Navigate streets lined with ancient houses and take in the Mia Pagoda, which houses some 270 early Buddhist statues. Continue on two wheels to Duong Lam, where centuries-old houses reveal an ancient way of life. Day 4: Hanoi – Lan Ha Bay. Journey onwards to Hai Phong and the UNESCO World Heritage Site of Halong Bay to see ‘where the dragon descends to the sea’. Board your boutique wooden junk and enjoy lunch as you drift over emerald waters past towering rocky outcrops, some more than 100 metres high. Venture south into the maze of Lan Ha Bay, the little-visited extension of Halong Bay. Step ashore on the island of Cat Ba and cycle through a wonderland of lush greenery to the remote village of Viet Hai (or take an electric car, if you prefer). Here, meet the islanders and learn about their daily life. Back on board, try your hand at preparing traditional dishes in the restaurant kitchen. After a day of adventure, take your place on the terrace deck and watch the sun sink behind the bay’s myriad islands. Day 5: Lan Ha Bay – Hanoi – Hoi An. Rise early for a Tai Chi class on the deck, or simply drink in the first rays touching the water. After breakfast, hop on a small bamboo boat rowed by locals, or paddle by yourself in a kayak through an endless sea of islands. Back on board, enjoy breakfast with more spectacular views as you drift back to port. Transfer to Noi Bai airport for the short flight south to Danang and transfer to the UNESCO World Heritage listed waterside town of Hoi An. Spend your morning at leisure. Later, take an afternoon walking tour to discover this charming historic town, a major south-east Asian trading post in the 16th and 17th centuries and now a living museum. Roam narrow cobbled lanes where Dutch and French colonial houses are squeezed between Chinese tea warehouses and Japanese temples – a clue to the town’s mixed heritage. Inhale the aromas and flavours of Hoi An’s lively market stalls. Step inside the Old House of Duc An and Fukia Assembly Hall. Marvel at the 400-year-old Japanese covered bridge – one of the few built outside Japan. After an afternoon wandering beneath the luminous lanterns, it’s time to make your own. Join a local master in the studio and learn the traditional art of lantern making. Unlock the secrets of time-honoured recipes in a half-day culinary masterclass. Savour the many flavours of Hoi An with a traditional breakfast in Vy’s Market Restaurant, where a central courtyard is lined with individual food stalls. Join your guide for a tour of the town’s markets bursting with tantalising fruits, spices, herbs, fish and noodles. Gain an insight into how ingredients are selected and assembled to create local dishes. Then, return to the Market Restaurant to see how traditional dishes are cooked, from grilling rice crackers to making fresh ‘bun’ and ‘cao lau’ noodles. Now inspired, try your own hand at making local delicacies in a 2.5-hour masterclass, before enjoying the fruits of your labours. Spend the afternoon at leisure. Day 8: Hoi An – Hue. Journey overland to Hue, the former Imperial capital of Vietnam. Along the way, stop at Cham Museum to lose yourself amongst the finest collection of Cham sculpture in the world. Step inside one of Hue’s beautiful garden houses for a private lunch. Tha Om Garden House offers an excellent opportunity to relax and enjoy traditional Vietnamese hospitality, complete with fascinating stories from your hosts, Pham Ba Vinh and his wife, Ton Nu Cam Tu. Later, take in the Tomb of Khai Dinh, a fascinatingly strange combination of Vietnamese, Chinese and European styles. Unpeel the layers of this ancient imperial city today. Start at The Imperial Citadel, the seat of Nguyen Dynasty rule between 1802 and 1945. Lose yourself amongst over 100 fascinating buildings and structures that have miraculously survived years of conflict. Take a short drive through the rolling hills that encircle Hue, arriving at the serene tomb of the ‘poet Emperor’, Tu Duc, set in an elegant garden of pine trees and frangipanis. For a stark contrast, continue to the Tomb of Minh Mang where an architectural complex of palaces, temples and pavilions awaits. Next, enjoy true Vietnamese hospitality in a unique home on the banks of the Huong River. Indulge in an exclusive private lunch within the walls of this traditional stone mansion, which stands proudly in a serene and expansive garden adorned with carp-filled ponds. Continue by boat along the dreamy Perfume River as far as Thien Mu Pagoda, one of the oldest religious buildings in Hue. Explore the gardens and the distinctive seven-story octagonal tower, before a final stop at the lively Dong Ba Market. 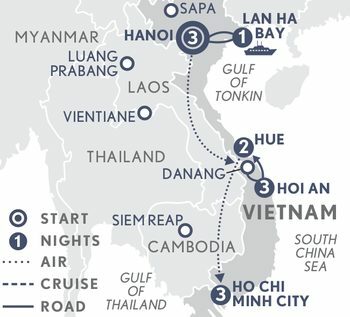 Day 10: Hue – Ho Chi Minh City. Transfer to Hue airport for your flight to Ho Chi Minh City. This evening, see and taste the city from the back of a vintage Vespa. Enjoy a unique view of the city after dark as your weave through buzzing streets. Plunge into the maze of narrow alleyways to savour the sizzling street food at places only locals know. Then, journey downtown for a taste of Banh Xeo, a local delicacy. Stop at a hidden coffee shop for a taste of Vietnamese acoustic music before finishing the evening with a drink at the city's top live music venue. Day 11: Ho Chi Minh City. Delve into the Cu Chi Tunnels for an unrivalled insight into life during the war. This incredible network of narrow tunnels was built during resistance to the French colonisation and used extensively during the Vietnam War. Take a guided exploration of the complex network, discovering underground storage rooms, make-shift hospitals and sleeping quarters. Return to Ho Chi Minh City for lunch. Later, embark on a half-day guided tour of this ever-vibrant, ever-changing city. Visit the Reunification Hall, one of the most historic landmarks in Ho Chi Minh City. Stand in the very spot where the official handover of power took place during the Fall of Saigon in 1975. Pause at the magnificent Notre Dame Cathedral and Post Office, dominated inside by an enormous portrait of Vietnam’s communist leader Ho Chi Minh. Finish your tour at Ben Thanh Market before returning to your hotel. Day 12: Design Your Day Ho Chi Minh City. Discover the best of Ho Chi Minh City with your choice of activities. Cruise the Mekong Delta to Ben Tre, a province famous for its coconut production and tranquil network of crisscrossing rivers and canals. Take a xe loi (rickshaw) through the village and onwards to the Huu Phuoc Bridge. Embark on a boat trip through narrow waterways, stopping to watch locals use centuries-old brick-making methods. Then, hop on a bike to cycle through lush tropical scenery to a factory that produces famous Hu Tieu noodles. Take a short stroll to meet a local family and get a unique glimpse into their daily life. Enjoy fresh fruits and tea with your host before heading out again for a trip through the canals by sampan, a type of boat used on the delta waters for centuries. Pause for a riverside five-course lunch filled with local specialties. Then, cycle to My Long to visit a former Vietcong soldier and watch as he and his wife produce the famous rice paper. Alternatively, a half-day silversmith tour will steer you to the treasures of the city, including the assembly hall built in 1896 using the contributions of Southern Vietnamese craftsmen, silversmiths, goldsmiths and jewellers. Learn about the development of Vietnamese jewellery as you explore. Soak up the vibe in the market, a hive of handicrafts and every type of jewellery imaginable. Then, onwards to a silversmith workshop where the master teaches you how to make a silver ring, from beginning to end. Keep your one-of-a-kind ring as a souvenir of your silversmithing experience. Or, dive into city life on a half-day cyclo and Vespa tour through the bustling streets of Ho Chi Minh City. Head to Tao Dan Park, one of the largest and oldest city parks, and enjoy famous Saigon coffee with the locals while serenaded by beautiful bird calls. Back in the cyclo saddle, you’ll be whisked to the memorial park dedicated to Thich Quang Duc, the Buddhist monk who famously performed self-immolation to protest the persecution of monks by the South Vietnamese government. Switch from cyclo to vintage Vespa for your tour of iconic markets and little-known sites, including a secret weapons bunker hidden in a busy alley. This weapon store, now recognised as a National Historical Site, went undetected for many years and played a key part in the Viet Cong’s Saigon offensive. Breathe in the colours of Ho Thi Ky Flower Market before sampling sensational pho at one of the best-kept secrets in Ho Chi Minh City – the perfect end to your adventure. Day 13: Depart Ho Chi Minh City. Transfer to Tan Son Nhat Airport for your onward flight.